Will Mnangagwa Remove Mugabe's 'Dirty Name' From Airport? Commander-in-chief of the Zimbabwe Defence Forces President Mnangagwa and Zimbabwe Defence Forces Commander General Phillip Valerio Sibanda inspect a Guard of Honour during Defence Forces Day celebrations at the National Sports Stadium in Harare. Thousands of people from all walks of life yesterday thronged various centres countrywide to celebrate 38 years of the Zimbabwe Defence Forces (ZDF) existence and excellent performance in the defence and security arena. The commemorations, which were the first to be presided over by President Mnangagwa, were held under the theme "Zimbabwe Defence Forces Dedicated to the Defence of National Sovereignty, Stability and Socio Economic Development". ZDF was formed just after independence in 1980 through the amalgamation of the victorious revolutionary Zanla and Zipra forces and the vanquished Rhodesian Front fighters. The national annual event is special in that soldiers and airmen are honoured for the work they do in maintaining peace and tranquillity in the country. It is also a day when members of the public have the chance to see how the forces operate and the sacrifices they make on a daily basis in protecting the country. Provincial ministers and senior civil servants read the President's speech in events held in the country's other nine provinces. The main event was held at the National Sports Stadium in Harare. The stadium was a sea of banners, among them "Celebrating our Defence Forces", "Defending Our Sovereignty", "Promoting Peace, Stability and Economic Growth". It was a colourful and carnival event at the 60 000-seater National Sports Stadium that reverberated to Jah Prayzah's music, parachute jumps from members of the Air Force of Zimbabwe and traditional dance and displays by the security forces. Soccer fans were later treated to a soccer match between ZDF Select and Malawi Defence Forces. 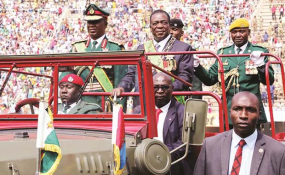 The celebrations began with the arrival of First Lady Auxilia Mnangagwa, followed by the Commander-in-Chief of the Zimbabwe Defence Forces President Mnangagwa in an army vehicle to a rousing welcome from the crowds who cheered and chanted the popular "ED Pfee" slogan. This was followed by the playing of the National Anthem with the fly past of K8 jets in a diamond formation. President Mnangagwa then proceeded to inspect the guard of honour, which was followed by the march past in slow and quick time then advance in review order. Chaplain General Colonel Joseph Nyakudya, who gave the opening prayer, entertained the crowd after he gave a short sermon, but pregnant with meaning, in which he used humour to counsel people and urge good morals in society that included executing duties whole heartedly and also ensuring that one provides for parents, family, respecting in-laws and being responsible people in society. President Mnangagwa took to the podium to give his national address in which he encouraged the forces to remain resolute, and to diligently and professionally execute their mandate to protect Zimbabwe, its people, its national security, interests and territorial integrity. After delivering his speech, the President joined services chiefs, high ranking Government officials and diplomats in watching the defence forces performing their drills and displays. Displays started with the major attraction - parachute displays by the ZDF and some civilians. The crowd erupted into frenzy when the 15 sky divers showcased their skills, with the two female paratroopers impressing many, including the First Lady Auxillia Mnangagwa. The AFZ traditional dance group left the crowd clamouring for more after showcasing their energetic dancing prowess. Jah Prayzah thrilled and mesmerised the crowd with his popular songs, Kutonga Kwaro and Mudhara Achauya, which had the crowd on its feet and singing along. Also present at the function were Vice President Constantino Chiwenga, Vice President Kembo Mohadi, Service Chiefs, Government Ministers, Chief Secretray to the Office of the President and Cabinet, Dr Misheck Sibanda, Minister of State for Harare, Cde Miriam Chikukwa, members of the diplomatic corps, chiefs and other senior Government officials. Speaking before inviting President Mnangagwa to the podium, VP Chiwenga said over the years, ZDF had transformed into a respected force both in the region and internationally. "Their ability to safeguard the country's hard won independence, sovereignty, territorial integrity and national resources in the face of insurmountable pressure from our detractors is no mean achievement," he said. "The Defence Forces have also been active players in regional and international peace keeping and peace building obligations where their professional conduct was as usual beyond reproach." VP Chiwenga saluted the forces for spearheading community development projects throughout the country and said this was evident that the forces had embraced the ideals and objectives of infrastructure and utilities cluster of the ZimAsset and partnered with various communities in the building of schools, clinics and bridges. He highlighted that the ZDF were instrumental at the Reformed Church University in Masvingo where they partnered the University and other well-wishers in constructing a four lecture room block. "It is pleasing to note that the ZNA and AFZ conducted Medical Outreach Programmes where they provided free medical assistance at Mushandike and Rutanhire clinics respectively," he said. The ZDF was doing the work as part of its Community Assistance Week which they carry out every first week of August annually.